Peptide (C)KPAY GTTGL PRAKR KSVR, corresponding to residues 227-244 of rat P2RY2 (Accession P41232). 3rd intracellular loop (i3) between TM5 and TM6 domains. Homology Mouse - 18/19 amino acid residues identical; human - 17/19 amino acid residues identical. 1,2. Anti-P2Y2 Receptor Antibody (#APR-010), (1:200). 3,4. Anti-P2Y2 Receptor Antibody, preincubated with the control peptide antigen. Mouse mIMCD-K2 cell lysate (4 μg/ml) (Rajagopal, M. et al. (2011) Am. J. Physiol. 301, F544.). Rat DRGs (Arthur, D.B. et al. (2005) Proc. Natl. Acad. Sci. U.S.A. 102, 19138.). Rat dorsal root ganglia (1:300) (Mo, G. et al. (2013) Mol. Pharmacol. 83, 640.). Human eye tissue (Fries, J.E. et al. (2005) Invest. Ophthalmol. Vis. Sci. 46, 3000.). Rat PC12 cells (1:100) (Arthur, D.B. et al. (2005) Proc. Natl. Acad. Sci. U.S.A. 102, 19138.). Rat osteoclasts (8 μg/ml) (Alvarenga, E.C. et al. (2010) Bone 46, 355.). Expression of P2Y2 receptor in rat cortical neurons.Immunocytochemical staining of rat cortical neurons using Anti-P2Y2 Receptor Antibody (#APR-010). 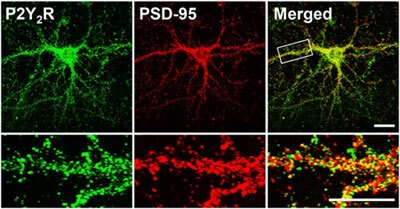 P2Y2 receptor immuno-colocalizes with PSD-95, the synaptic marker.Adapted from Choi, R.C. et al. (2013) Mol. Pharmacol. 84, 50. with permission of the American Society for Pharmacology & Experimental Therapeutics. Anti-P2Y2 Receptor Antibody (#APR-010) is a highly specific antibody directed against an epitope of the rat protein. The antibody can be used in western blot, indirect flow cytometry, immunoprecipitation, immunocytochemistry, and immunohistochemistry applications. It has been designed to recognize P2RY2 in rat, mouse, and human samples. Immunohistochemical staining of human ovarian carcinoma biopsies using Mouse Anti-KCNN4 (KCa3.1, SK4) (extracellular) Antibody (#ALM-051) and rabbit Anti-P2Y2 Receptor Antibody (#APR-010). Positive co-expression is detected in ovarian neoplastic cells (merged image). Expression of KCa3.1 is also observed in stromal cells (*); however, P2RY2 does not co-localize with KCa3.1 in these cells. Adapted from Robles-Martinez, L. et al. (2017) Sci. Rep. 7, 4340. with permission of Nature Publishing Group. Ellegaard, M. et al. (2017) Purinergic Signal. 13, 545. Rat primary astrocyte culture lysate. Paniagua-Herranz, L. et al. (2017) Front. Pharmacol. 8, 937. Human esophageal epithelial cell lysate. Wu, L. et al. (2017) J. Gastroenrol. Hepatol. 32, 1341. Cui, J.D. et al. (2016) Chem. Biol. Interact. 259, 291. Ribeiro-Filho, A.C. et al. (2016) BMC Pharmacol. Toxicol. 17, 29. Mouse bone lysate and osteoblast MOB-C cell lysate. Seref-Ferlengez, Z. et al. (2016) PLoS ONE 11, e0155107. Rat cardiac fibloblast lysate (1:200). Certal, M. et al. (2015) Cell Calcium 58, 518. HEK 293 transfected cell lysates. Yashima, S. et al. (2015) J. Biochem. 158, 155. Human MCF-7 cell lysate (1:200). Chadet, S. et al. (2014) Carcinogenesis 35, 1238. Rat cortical neuron lysate (1:1000). Naviaux, R.K. et al. (2013) PLoS ONE 8, e57380. Mouse mIMCD-K2 cell lysate (4 μg/ml). Rajagopal, M. et al. (2011) Am. J. Physiol. 301, F544. Arthur, D.B. et al. (2005) Proc. Natl. Acad. Sci. U.S.A. 102, 19138. Palygin, O. et al. (2018) Punergic Signal. 14, 485. Mouse anterior pole eye sections. Fonseca, B. et al. (2017) Front. Pharmacol. 8, 719. Robles-Martinez, L. et al. (2017) Sci. Rep. 7, 4340. Rat spinal cord sections (1:150). Shi, Y. et al. (2017) Gene 627, 263. Takano, T. et al. (2014) Glia 62, 78. Rat dorsal root ganglia (1:300). Mo, G. et al. (2013) Mol. Pharmacol. 83, 640. Fries, J.E. et al. (2005) Invest. Ophthalmol. Vis. Sci. 46, 3000. HEK-293T cells transfected with rat P2Y2R (1:200). Alvarenga, E.C. et al. (2010) Bone 46, 355. Traves, P.G. et al. (2013) J. Immunol. 190, 4226. Zerpa, H. et al. (2013) Eur. J. Pharmacol. 702, 242. Mortensen, S.P. et al. (2012) J. Physiol. 590, 6227. Anti-P2Y2 Receptor (extracellular) Antibody (#APR-102). This antibody detects P2Y2 in an extracellular domain and can be used to detect the receptor in live cell flow cytometry. Anti-P2Y2 Receptor (extracellular) Antibody (#APR-102). This antibody detects P2Y2 in an extracellular domain and can be used to detect the receptor in live cell imaging.